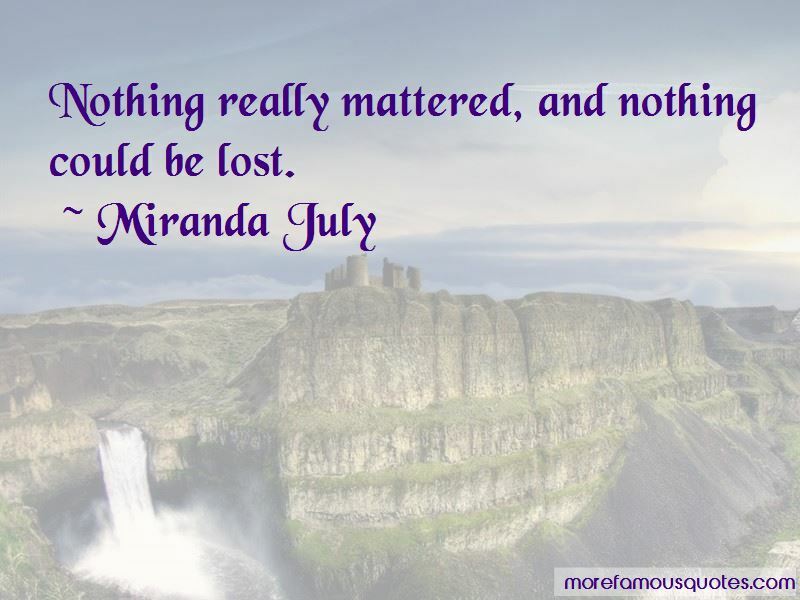 Enjoy the top 217 famous quotes, sayings and quotations by Miranda July. “And why had Deb's last boyfriend dumped her? Maybe you didn't French-kiss him enough. I promise you that wasn't it. Tell me how many times a day you kissed, and I'll say if it was enough. Was she terrifyingly beautiful? Was she so ignorant she didn't deserve the truth? Was she also a liar and thus it was something they did together? I don't believe in psychology; which says everything you do is because of yourself. That is so untrue. We are social animals, and everything we do is because of other people, because we love them, or because we don't. I felt like I could do this forever, because nothing mattered more than anything else. This person mourns the fact that she has ruined her one chance to be loved by everyone; as this person climbs into bed, the weight of this tragedy seems to bear down upon this person's chest. And it is a comforting weight, almost human in heft. This person sighs. This person's eyes begin to close, this person sleeps. Was all this real to her? Did she think it was temporary? Or maybe that was the point of love: not to think. there were no options. There had been options, before the baby, but none of them had been pursued. I had not flown to Japan by myself to see what it was like there. I had not gone to nightclubs and said Tell me everything about yourself to strangers. I had not even gone to the movies by myself. I had been quiet when there was no reason to be quiet and consistent when consistency didn't matter. For the last twenty years I had lived as if I was taking care of a newborn baby. People just need a little help because they are so used to not loving. It's like scoring the clay to make another piece of clay stick to it. “It was Kelda who said she wished there was a pool in Belvedere, because they were obviously very lucky to have a swim coach living in town. I hadn't said I was a swim coach, but I knew what she meant. It was a shame. “Why do you think we are the only animal that kisses? She was near again. You will eat, you will laugh at stupid things, you will stay up all night just to see what it feels like, you will fall painfully in love, you will have babies of your own, you will doubt and regret and yearn and keep a secret. You will get old and decrepit, and you will die, exhausted from all that living. In truth, I had not yet learned how to hate anyone but my parents. I was actually just standing there in love. I was not even really standing; if she had walked away suddenly, I would have fallen. She was standing on the moon and if I responded I would be on the moon too, right next to her. I definitely wanted much more normalness than what was around me. There's all different kinds of people, but I don't think it's that unusual that once you get like a little power, you get to do your weird thing even more. The level of control, that's part of what's so appealing about filmmaking - you have so much control over what the reader, the viewer, is noticing from moment to moment. They can't do that boring boring boring thing as easily. Most great filmmakers are good at place. Like how people say, like, "The city itself is a character in the movie," you know? I'm so interior. I always forget there's such a thing as an exterior wide shot, where you can see where someone is. As opposed to just: how can we show what this person is thinking, in an abstract way that is felt? Want to see more pictures of Miranda July quotes? Click on image of Miranda July quotes to view full size.